Title: : Darbieshire described. Anno 1610. Description: Derbyshire. A decorative map from the second edition of Speed's seminal atlas, 'The Theatre of Great Britaine'. Showing vignette of Derby and St. Ann's Well. 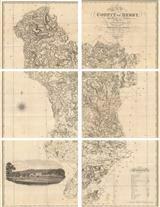 Description: Early county map with elaborate cartouche featuring the coat of arms of the Earl of Derby. Description: Wonderfully ornate county map with insets of Derby and Buxton and various coats of arms and decorative flourishes. Coloured. 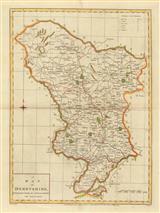 Description: Fine copper-engraved county map of Derbyshire with decorative cartouche. Coloured. 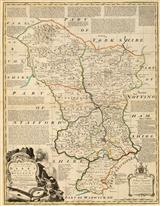 Description: Fabulous map of Derbyshire surrounded by historical and descriptive text. Decorative cartouche depicts the landscape of the Peak District. Original colour. 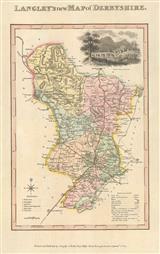 Description: A rich and detailed map of Derby and the Peak District, taken from Bowen’s landmark survey of Georgian England. Original colour. 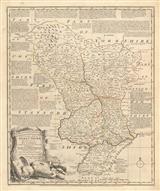 Description: Detailed county map with elegant title cartouche and reference to the Hundreds. Coloured. Description: Attractive map of the county of Derbyshire highlighting the developing road network during the Industrial Revolution. Original hand colour. Description: County map of Derbyshire highlighting mail coach routes. Original hand colour. Description: Derbyshire, divided into hundreds and with elegant vignette of Matlock Bridge. Original colour. Description: Derbyshire. 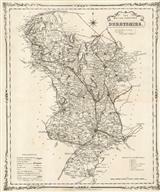 An attractive Victorian map of the county with attention to its roads and railway lines. 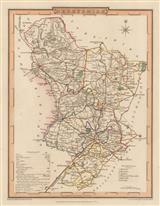 Description: Detailed county map of Derbyshire marking the boroughs and county divisions. Original colour. 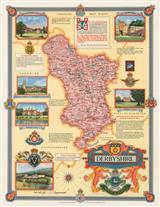 Description: Pictorial county map commemorating Derbyshire's contributionson the home front during WWII. Laid down on archival linen. Printed colour.